There comes a time almost every day when I take a pause from avoid doing the work I should be doing, and instead, wander around through the world that is online shopping. Lately, swimming pools and warmer weather have been on the brain. While I may not have a body or a tan like Candace Swanepoel (just you wait, folks! ), I’m already in bathing suit mode. These two from Victoria’s Secret are really catching my eye. Lovin’ the polka dots and tie-dye. 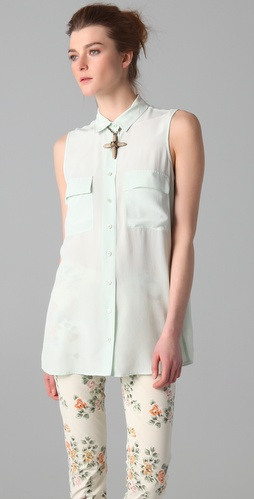 I really like the style and length of this Equipment blouse – such a basic piece. I even kind of like the floral jeans with it. This Lisa Ho blazer looks fun and different, not to mention I love the color. I am actually kind of obsessed with the skirt and top it’s paired with on the website. Jessica Alba wore it with jeans the other day on Extra. All are yet to be purchased, but the bikinis will be mine soon!